Whether you sell crochet for fun or for your business, you need to get the price just right. One of the most frequently asked questions I see over and over is “how do I know how to price my stuff?” No matter where you sell – Etsy, at local craft fairs or to your friends and family, you need to figure out a way to price your items fairly, both for you and your customers. I consider you a friend and I want nothing more than to see you succeed, in business and in life. Price too high and you’ll turn away potential buyers. Price too low and you’re selling your self short. It’s difficult to find that perfect blend. I can’t say I’ve found the perfect solution but I have come up with a formula that works really well for me. This is a pretty basic precursor that I’m sure you’re already doing if you’ve sold more than a few items. 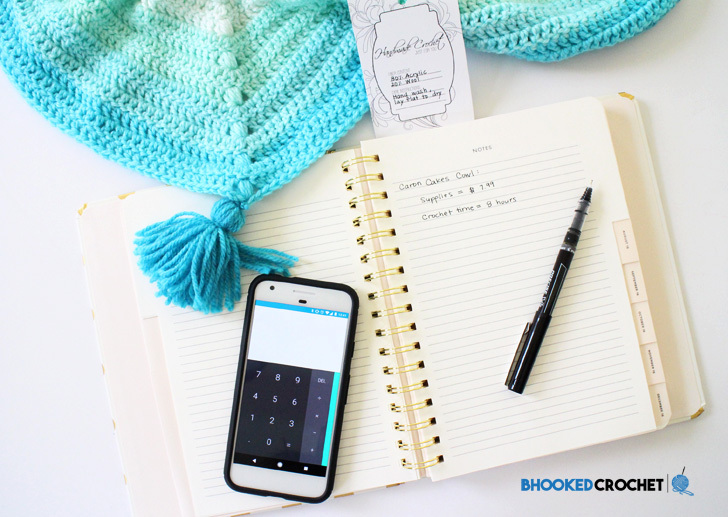 When you make the decision to sell crochet items you’ve made, you should invest in a little notebook to help you keep track of expenses. Here are the things you’ll need to record and have handy before moving on to the “magic formula”. pretty simple, right? You just need to know what you have invested in the item before you can put a fair price on it. Now here’s the hard part – putting a dollar value to your time. This is the hardest part for most people. Everyone’s time has a different perceived value. I like to consider what I’m removed from while crocheting the item for commission. For me, crocheting things for contract or sale prevents me from providing patterns, tutorials, how to’s, tips, etc for B.hooked Crochet and B.hooked Knitting, an activity I enjoy the most. Therefore, my time value is higher (because I enjoy doing other things more). For others, crocheting takes them away from family or maybe their regular day job. If making things to sell is your total passion and you would do it no matter what, your time value may be lower. No matter what the case may be, you have to assign a value to one hour of your time. If you’re completely stuck and need a little guidance, I typically value my time at $20-$30 per hour for commissioned projects. This certainly limits my crochet item sales and that’s okay. I prefer to spend my time with you and other makers in my audience. If you prefer to be making and selling your goods, your cost per hour will likely be less. Before moving on to the formula, decide what one hour of your time is worth. This is the raw cost of the item – how much money was taken out of your wallet to crochet the item. Record this number on a piece of paper or in a spreadsheet. Step 2 – Add up the total number of hours needed or spent making the item, from start to finish. Be as honest as possible here. Round to the nearest hour if need be to make your calculations easier. Record this number too. The calculation is simple but this is certainly going to take some thought. My best advice is not to sell yourself short. Your time and talent is very valuable! When making your decision, remember this: the dollar amount you put on your time will determine the type of customer who purchases from you, not the other way around. Remember to be confident in yourself and your ability, be open and honest with your customers and you will succeed in business and in life!